Salt and Pepper Squid - Gutom Na! Posted on Sunday, November 29th, 2015 at 4:01 pm. First prepare your squid. Rinse it well in cold water. Cut the tentacles off using one cut, keeping about a 1/4 inch of the hood in order to end up with one piece of calamari that includes all the tentacles. If you’re using larger squid, you can cut these pieces lengthwise in half in order to make them bite-sized. 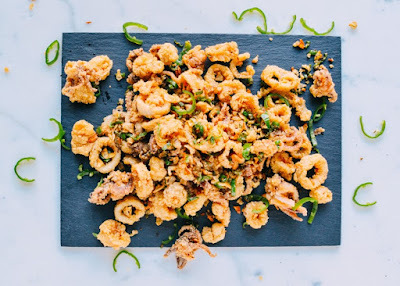 Having each piece be roughly the same size is important for achieving the same cooking time for each piece of calamari. Drain the squid pieces in a colander and transfer to a bowl. Marinate the squid in the shaoxing wine and sesame oil. Toss gently and set aside. In a medium deep pot, add enough oil so that the level of oil reaches 4 inches up the side of the pot. Heat the oil until the temperature reaches 325 degrees. While you’re waiting for the oil to heat, prepare your dry mixture. Combine the all-purpose flour, semolina flour, cornmeal, salt, and white pepper in a medium bowl. Set aside. When the oil reaches temperature, you’re ready to start dredging your squid. Work in batches of small fistfuls of calamari. Gently squeeze off any liquid and dredge the squid in the dry mixture. Using a long-handled sieve or slotted spoon, lower the calamari into the hot oil. Gently move the calamari pieces back and forth. Let them fry until golden brown, about 2-2 1/2 minutes. Remove all the calamari and let drain on a paper-towel-lined plate. Taste one piece of calamari for saltiness (be careful, it’s hot). You can sprinkle more salt immediately after frying to your taste. A necessary step, however, is to crack some fresh white pepper over the freshly fried squid. Continue frying in these small batches and seasoning with white pepper until you’ve fried all the squid. Now the next phase: stir-frying the fried squid. Heat a wok over medium-high heat. Add a tablespoon of vegetable oil. Add the ginger and let it fry in the oil. After about 20 seconds, add the garlic. Stir the garlic around the wok quickly in order to prevent burning. When the garlic gets lightly golden in color, add the peppers. Continue to stir fry for another 30 seconds. Add the squid to the wok and stir fry quickly in the aromatic mixture for about a minute or so. Plate and serve immediately with white rice! And don’t leave those crispy pieces of garlic and pepper behind!